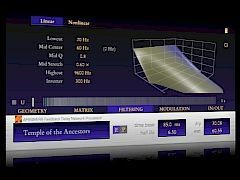 AriesVerb, Software algorithmic reverb from Aries. This update offers small, but significant, feature additions to the sound engine, according to the company. There is now an 'Algorithm' page on the UI to configure the basic layout of the feedback network, together with a schematic. There are also 23 new presets. A new option, "filters before output", is designed to allow you to move all filters to a location before the output is taken. This is designed to help shape the envelope of the reverb tail, and also puts the non-linear saturation into the direct path between input and output (as it was in AriesVerb 0.4). Several new "Tube Amp" like presets draw on this feature. There is a selection of three different pre-emphasis filters for the saturation. The delay line taps can now be routed directly to the output, in adjustable amounts for each segment. This is designed to help shape the early response of reverb programs. • Added Algorithm Page to the UI, replacing the Geometry Page. • Added new features "filters before output" and "tap outputs". • Added emphasis filters for the nonlinear saturation. • Added 23 new presets (total 167). • Changed LFO spread to degrees with extended range. • Fixed UI control for angles. • Fixed filename dependency, AriesVerb.dll can now be renamed. • Fixed front panel texture. Detunized.com releases DTS004 – Vox Populi Synthesizer Detunized says all 5 original Polivoks waveforms where captured and integrated into their multiwaveform oscillators. HighC Updated to v2.75 The new version is said to feature numerous improvements, among which the ability to import audio samples. Shure Shipping X2u XLR-to-USB Signal Adapter Shure Incorporated today announced that the X2u XLR-to-USB Signal Adapter is now shipping and is available by itself or in bundles with either the SM57 or SM58 microphones.